The research, conducted by an industry coalition named the Advanced Advertising Media Project (AAMP), which includes ad technology provider BlackArrow and various media and technology companies, studied the reactions of 1,000 viewers to on-demand TV programming in a lab environment. The research focused on "VOD" which is traditionally delivered by a pay-TV operators to the TV, and accessed via the remote control. These characteristics would distinguish the VOD experience from today's online experience of say, watching a TV program via Hulu, on a computer or tablet. However, if you assume as I do, that connected TVs will soon become the norm, and that advertising in video delivered to them will also become commonplace (see more, for example about YuMe's integration of its ad technology with LG, and soon Samsung TVs), then for all intents and purposes any distinctions between VOD and online-delivered TV programs will soon become meaningless, making this AAMP research more broadly relevant to online delivery as well. 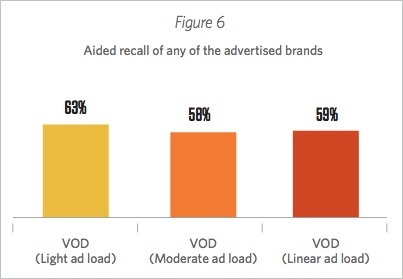 Among the key takeaways is that heavier ad loads neither affect viewers' aided recall of the ads, nor their engagement. In the research, light, moderate and heavy ad loads (3, 5.5 and 8 minutes, which is the traditional linear ad load per 30-minute program) were tested. As the graphs below show, both aided recall and purchase intent measures were pretty comparable across all 3 ad loads. In addition, even when watching with the full 8-minute load, engagement was 11% higher in the final quarter of a program than during the first. Only 9% of viewers said there were too many ads and positive reactions to the ads surpassed negative ones by 65% to 49% (and note there was no targeting of ads used at all to increase relevance). Viewers exposed to the heavy ad load were basically no more likely to say there were too many ads than were those who experienced the light ad load. Admittedly, it's always essential to take industry-sponsored research with a grain of salt, particularly when conducted in a controlled lab environment. However, I think the research helps illustrate 2 larger points - first, when viewers have more control over what they want to watch, as they do with on-demand programs, there's a more conducive environment for ads, and second, viewers are sophisticated enough to understand there's a quid pro quo in order to get high-quality programs for free. In other words, advertising is the price you have to pay. Does all of this mean that on-demand programs should start carrying full linear ad loads? No. However it does mean that TV networks and other content providers have some flexibility in bumping the ad loads and when done in combination with other enhancements like viewer choice (e.g. YouTube's "True View" format) and appropriate targeting, they can likely expect positive results. Ad monetization remains a critical part of the online video landscape; learning how to optimize it will no doubt be the subject of ongoing research and testing.